Cinemax has cooked up a number of flavours of its Rytmikmusic production suite, allowing the musically-minded playgrounds with which to explore dance, chip tunes, hip hop, rock and now world music. 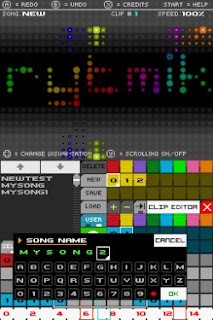 Rytmik World Music is a fun little musical tool that lets you create songs with its range of pre-packaged clips, and diving into the clip editor lets you craft your own sample melodies and beats. If you haven't fiddled around with these tools yet then we'd recommend checking out our original Rytmik: Rock Edition review for a more detailed account of what to expect from this suite, as the feature set is pretty much the same across all entries. That feature set is still mighty impressive, allowing lots of freedom to tinker, bend and create something special with the 117 samples themed around ethnic styles from across the globe. Fiddling with polyphony, delay, arpeggio and channel settings in the clip editor provides a surprisingly deep amount of control over your music. That isn't to say Rytmik is for pros only: someone who has never plucked a string before can noodle out something interesting with the stock clips. A newcomer may get a sense of panic from the dizzying interface, at first, but stick with it and it all falls into place after poking a few buttons; dragging and dropping samples onto the four tracks is a breeze. Studying the 11 pre-loaded tracks will give a good concept of what can be done and offer pretty good starting points for beginners to get their hands dirty. Expect lots of drums, plucked and mallet sounds, didgeridoos and assorted wind and chime instruments in its bank; the sample count isn't massive — it's the smallest one yet, actually — and while a dedication to world sounds is admirable, the low count does feel somewhat more limiting than before as there's just less to work with. The package is polished but also lacks a compelling independent visual identity, mostly looking like a flat version of the original's interface. We wouldn't expect a radical redesign of the UI — it doesn't need one — but the visual character that made the other suites pop is lacking. It may be an audio tool first and foremost, but considering the amount of time to be spent looking at its switches and buttons it's disappointing that they aren't very appealing. Up top is a visualizer with 20 styles to choose from, but none of them are all that remarkable. The audio quality keeps up the series' high standards, but sadly there still isn't an easy way to export your masterpieces. Cinemax keeps up its streak of high-quality, accessible music tools with Rytmik World Music, and anyone with a passing interest in music creation will find the suite a joy to tinker with. While the sample count is the smallest it's ever been and the interface has lost some of the character of prior releases, there's still a lot of creativity to unleash and fun to be had with what's on offer.